Between 1837 and 1859, King Street’s Georgian traders all but disappeared. Only Simonds' Bank, Rusher's Bookshop, Millard's Ironmongery, Tutty's Bakery and Botley's Jeweller's remained. Some businesses, such as the George and the Shoulder of Mutton and the grocer and draper and Nos. 21 & 22 survived under new management. In 1840, Thomas & Samuel Williams' London Coach Office at No. 7, on the corner of the Butter Market, was still in dispute over payment to their coach supplier, John Brown of Castle Street. Samuel paid his half, but there was some doubt as to whether he was liable for the rest as the business was not an official partnership: 8 o'clock and 9 o'clock coaches being run by each brother. Thomas seems to have been unable to pay his share of the rising debt. In May 1841, was announced, "An appeal in behalf of the wife and family of Thomas Williams is most humbly made. Having been well known for 35 years in this town as a coach proprietor. He is now utterly ruined, partly by heavy losses in business, and ultimately by the operation of the Railroad. A few friends, to whom himself and family have been long known and respected, are anxious to raise a sum to place his wife and large family in some little way of business, and they will feel grateful for any assistance which will enable them, with their own exertions, to maintain that respectability and character they have hitherto done." Joseph Whatley (1792-1876) the solicitor remained alone in the offices at No. 7 (also known as No. 6 Butter Market), presumably on the upper floor (and probably of No. 6 as well) as, around 1845, William Hedgcock Wellsteed (1819-1895), expanded his linen drapery business from 1-2 Middle Row to both sides of the road, by opening on the ground floor at No. 7 King Street. Whatley lived at Holme Green in Wokingham. By 1859, he was in partnership with Robert Coster Dryland (1827-1901) and they had moved along one property to No. 7 Butter Market. The London & County Bank opened at No. 6 around 1857. It seems to have had a way through to the Butter Market as well. In August 1858, WH Wellsteed went into partnership with his former employees, Messrs. Grace and Hutt, in order that he might step back from direct involvement in running the shop. It was closed for ten days, before a grand re-opening on 20th. In 1861, Wellsteed's moved to their better known property in Broad Street, opening "a very splendid drapery warehouse" there, and the Bank expanded over the whole corner of Nos.6-7. It was shortly after this that the property was rebuilt, as befitted a prominent bank, to become the magnificent gabled structure seen in the photograph above. It was something of a rival to Simonds' Bank next door. 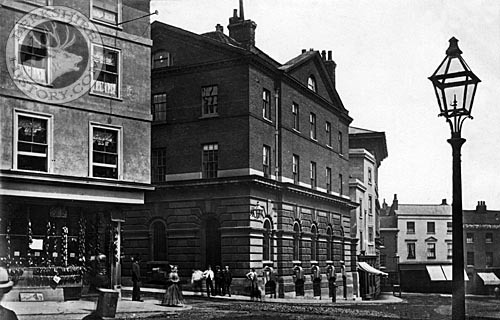 The bank closed in 1877, as their new branch in the Market Place had just been completed. After standing empty for some time, Nos. 6-7 eventually became the offices of the auctioneers, Frank Goldring & Co. Then, around 1889, Charles Nossiter Collings (1847-1898), shoemaker, moved in from a much smaller shop at 12 High Street. It must have been at this time that beautiful stone ground floor fascade was removed and replaced with shopfronts. "Yesterday afternoon [16th December 1858], a little boy and girl, the children of Captain Codd, (late Adjutant of the Royal Berks Militia) narrowly escaped serious injury. It appears that while being left in a four-wheel vehicle near the Post Office in Broad Street [Nos. 97/8], for a few minutes, the pony started off at a rapid pace, and would have dashed the vehicle against a waggon that was standing in Middle Row had not a gentleman succeeded in slightly turning the animal's head. The pony continued its progress as far as the ‘Shoulder of Mutton’ public-house, King Street [No. 4], when a recruiting sergeant endeavoured to stop it. He was, however, knocked down, and the pony turning round, ran towards the shop of Mr. Tutty, confectioner [No. 23], and one of the shafts was forced through his shop window. The animal was then secured, and the children were removed from the vehicle without having sustained any injury. The sergeant who was knocked down by the pony was also uninjured." "Allow me to give a more particular account of the accident in King Street, on Friday last: As the pony with the helpless children was running down King Street, Joe Littleton of the 60th, (who was the first man on the ramparts At the storming of Moultan,) was crossing the road to go to dinner; of course, he dashed at the pony and seized, the reins; he was thrown down, run over, and very much bruised, but he checked the alarmed animal, and enabled the persons passing to overpower it. Everyone was bent upon saving the children. Littleton is confined to his bed sore wounded, with the comfort that it will cost him £1-7s, to make good the damage, done to his tunic and trousers, which he wore for the first time on Thursday. Surely, this praiseworthy attempt to save the lives of two children ought not to go unrewarded." William Robey opened the first ironmongers at Nos. 1 King Street about 1857, having moved from Welldale Street. This business was to remain there for many decades under differing ownership. In July 1865, by which time the shop had expanded around the corner into Nos. 13 & 14 High Street, it was purchased by the Margrett Brothers, Edward (1839-1914) and Thomas (1843-1915). who increased their product range to make the shop an 'ironmonger's, tool & cutlery warehouse' including No. 2 King Street. Thomas left the business about 1872 to become proprietor of the King's Head Hotel in Egham, but Edward continued, not only at what became known as Margrett Corner but also it is Kennet Ironworks, until 1892, when he sold up to Loveridge & Co to concentrate on the engineering side of his business in Duke Street. James Loveridge (1849-1926) had already taken over Nos. 1-2 in 1891, when Edward Margrett had reduced his shop down to No. 13 High Street only. The corsetry at Horniman's Corner (No. 8 King Street AKA No. 64 Minster Street) closed about 1845. About four years later, Cornishman, William Pearse Ivey (1812-1900) expanded his silk mercer's shop and drapery at 63 Minster Street into the shop next door at 8 King Street. His wife, Letitia. ran the millinery and dressmaking department. By 1859, they had moved to 44-45 Market Place. The shop was then taken over by HM Heelas (1832-1866), a younger brother of the Heelas brothers from Wokingham who founded the famous Department Store in Minster Street and Broad Street. He was a chemist who had previously worked in Oxford Street in London. At his new Reading shop, he advertised his own potions, powders and pills: Heelas' Solvent Dentifrice for dissolving dental tartar, Heelas' Electro-Galvanic Plate Powder for preserving and restoring electro-plated items, and Heelas' Bilious & Liver Pills to settle nausea and vomitting. All were proudly proclaimed to be free of mercury and the latter were apparently popularly prescribed by a local physician. He, unfortunately, died at the age of only thirty-four. The shop continued as a chemist's, first under Charles Henry Ridley (1840-1906), followed by James Stevenson and then Ernest Cardwell. Kirkshaw's Fishmonger's, next door at No. 9 (and adjoining the George Inn), switched to selling 'hams, pickles and sauces' in 1840. It become Mrs. Rebecca Hooper's Tobacconist's around 1842. In 1850, Samuel Barter took over the business, selling "a choice stock of foreign cigars of the best brands; also a large assortment of British-made [brands] ... Innkeepers supplied on very liberal terms" as well as tobacco from his own factory in Virginia Wharf where he employed ten men. Surgeon, Frederick Blissett Hooper, remained at No. 17 until about 1842, when Samuel Gostage (1811-1895) expanded his auctioneer's office there from next door at No. 16. Gostage was a Presbyterian and staunch liberal active in local politics. He had taken over from John Church two year's previously. The business had supposedly been going since 1775, although it only appeared in King Street in the 1820s. As an auctioneer, Gostage must have dealt with a lot of furniture as, by 1844, he also described himself as a furniture broker, and he later had a furniture warehouse in Abbey Square. From there, the business expanded into softer household furnishings. By 1850, the shop was known as 'Gostage's Warehouse' or 'Household Furniture Depot' with Cabinet & Bedding, Carpet & Floor-Cloth and Paper Hanging Departments. It boasted of being "The Largest, Cheapest & Best Carpet, Bedding & Household Furniture Repository in Berkshire". In 1855, the shop displayed books covering more than 30,000 French and English wallpaper samples "presenting a variety larger than the generality of London Houses, and at prices equally low". There were "Parisian novelties direct from the stainers, together with flocks, gold and metal papers, borders, decorations, also the Eugenie Stripe for Boudoirs in every shade and colour". By 1867, they had 100,000 on offer. It was in November of this year that Samuel brought his sons into the business. The company became known as Messrs. Gostage & Sons and the shop, 'Gostage's Furniture Emporium'. They employed ten men. The following year, while keeping the core shop at No. 16, they switched from No. 17-18 to Nos. 14-15 on the other side. The Reading Observer started at the former in 1873.The latter became Gostage's carpet department run by the younger son, Charles Gostage (1843-1896). Samuel Church Gostage Junior (1841-1893) was in charge of the rest. The former sold "Brussels, Tapestry & Kidderminster Carpets, Victoria Felts, Hearth Rugs... Floor Cloths, Kamptulicons and the Patent Linoleum". (Kamptulicon was a type of cork and rubber flooring.) Samuel retired around 1889 and his sons seem to have sold up to Charles Weller who reduced the shop to Nos. 15-16. Edwin Tanner turned No. 1 into a watchmakers. Charles Gostage continued an auctioneer business in Cheltenham. Samuel Church Gostage Junior also retired but stayed in Reading. Henry Millard (1782-1853) at Nos. 19-20 not only worked in tin as a whitesmith, but was variously described as a coppersmith, brazier and ironmonger since at least 1812. His son, James (1804-1885), took over upon his father's retirement around 1842 and moved the business to bigger premises next door at Nos. 17-18 about seven years later. As a master ironmonger, he employed six men. He sub-let the old shop at Nos. 19-20 to Henry Standerwick (1806-1872) who then turned it into a butcher's shop. However, he did not stay there long. By March 1854, Standerwick was at Abbey Cottage and the King Street building was derelict.. Thomas Okey who had run the grocer's at No. 21 was the landlord, but was unable to get his rent from either man . Indeed, James Millard's business closed that year due to his mounting debts. Standerwick's Butcher's became Joseph Challen (1812-1889)'s Drapery in 1855. In that same year, Mr. Challen was one of the many injured in the fatal Reading Train Crash of 12th September. Challen ran his business from this address for the next thirty-two years, but, like many others in the town, he sometimes diversified from his core business. He was the agent for Woods who made Quinine Cantharadine, Rosemary Hair Cream, Areca Nut Toothpaste and Cough Linctus. After his death in 1889, the drapery was taken over by John Hunt. 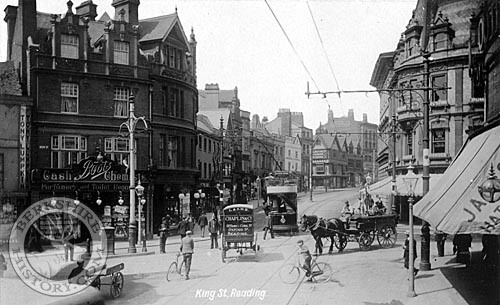 About 1893, Singer Sewing Machines took on the shop as their Reading Depot, having moved from West Street. Next door had been Okey's Grocery Store when Queen Victoria came to the Throne. Around 1856, he moved on and Daniel Budd Walden (1817-1894) took on the shop, presumably as a tenant, until about 1863 when he moved to 33 Broad Street. He went bankrupt in December 1866 and left Reading to live near Wrexham. Joseph Chesterton & Co turned both Nos. 21 & 22 into a tailor's and outfitter's shop, where they specialised in "liveries, hunting breeches and shooting suites" as well as manufacturing "juvenile clothing". No. 22 had previously been Charles Strudwick (1789-1862)'s woollen drapery but he moved to 49 Market Place by 1851 when John Creemer Clarke (1821-1895) was there, still as a draper. He had been a junior partner at Hyde, Son & Clarke of Abingdon since 1845 and later senior partner at Clarke, Sons & Co as well as MP for Abingdon. After Chesterton's residence, the shops were divided again, with Thomas Thorp's Second-Hand Bookshop at No. 22 and Frank Bloomfield's shop at No. 21, known as 'Bastin’s Toy & Fancy Bazaar,’ strangely referred to as a hardware store in a contemporary directory. The latter had a large stock of 'school treats' and '1d articles'. It suffered a serious fire in September 1894. Mechanisation began to enter the shops of King Street in the Victorian era, as evidenced by the confectioner, bread and biscuit baker at No. 23, Henry Tutty (1803-1862). He had been running the business since his father's death in 1841 and, twenty years later, "respectfully inform[ed] his customers and the general public that his bread is now manufactured on the premises by the patent bread-making machine, thus superseding the labour of Journeymen mixing the dough with their arms and hands. The advantage and superiority of this bread has been practically demonstrated by some of the most eminent medical men of the age, who have given their most decided opinion as to the wholesomeness, cleanliness and general superiority of bread made by Stevens' Machine". He met with an unfortunate accident in Minster Street in October the following year which eventually led to his death. JD George then took over the business. Though he largely concentrated on the confectionary side - specialising in bon-bons, wedding cakes and 'cosaques' (apparently Christmas crackers) - he seems to have also expanded the shop into a café-restaurant serving breakfasts, lunches and suppers: tea and coffee; chops and steaks; ices, puddings and soufflés. 'Wenham Ice' (ie. harvested rather than factory-made) was always in stock. He employed four men and one boy. As George & Co, they opened a new luncheon saloon in December 1894.